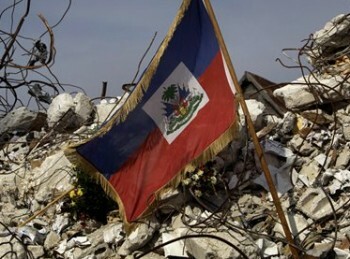 A Haitian flag sits on the rubble of the university of applied languages where 175 students died on Jan. 12 during the earthquake in Port-au-Prince, Monday, Feb. 15, 2010.
leveled most of the major higher education institutions in the Port-au-Prince metropolitan area. Haiti : 12 Janvier 2010 - 12 Janvier 2015, five years later, Where are we now? 12 Janvier 2013, 3rd anniversary of the Haiti earthquake, How do you feel?